The tagline for Mages of Mystralia is "become a spellmaster." Truly, you'd be hard-pressed to find a recent wizardly game with as deep and flexible a magic-crafting system. This framework, where players modify the elements, behaviors, and augments of individual spells to create brand new incantations, is worthy of expansion in a sequel. That's the good news. The bad news is that this inventive "spellmaster" system is mostly wasted in a generic action-adventure game. In the fantasy land of Mystralia, the era of the Mage-King is over. After the last of his line attempted a violent takeover of the kingdom, opposition mages fought back and ended his madness. Despite that act of heroism, mages became in Mystralia persona non grata. They retired to a hidden sanctuary and a non-magical regent ascended the throne. In this world wary of spellcasting lives Zia, a young woman with magic in her blood. When she summons accidentally a fire spell and burns down half her village, she chooses the path of self-exile. 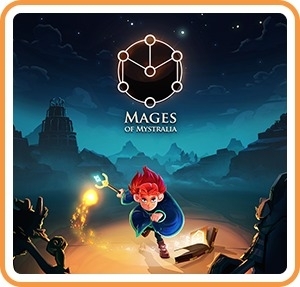 On the lonely road out of town she meets a potential magical tutor, who introduces her to the world of spell craft and an ominous threat to the peace and prosperity of Mystralia. While the premise in Mages of Mystralia is interesting, its storytelling is weirdly stunted. Dialogue is wooden and stilted, intriguing characters and sub-plots are introduced and then forgotten, revelations arrive with little fanfare, and the whole plot ends abruptly. There's one small bit that, while unimportant in the grand scheme of things, is emblematic of the wasted narrative potential of the game. As Zia is searching for four elemental sages, a wise mage tells her she must overcome her "shame," i.e. fire, which began her exile. Yet Zia marches to the Lava Grotto unimpeded and meets the fire mage in the same way she meets the mages of air, earth, and water. There's no catharsis, no payoff whatsoever. The gameplay loop of Mages of Mystralia comes out better, although it too is uneven. Essentially, this is a Zelda-like game, where Zia moves across an interconnected high-fantasy landscape dotted with towns, dungeons, and quest-givers. While overworld exploration, complete with in-need NPCs and lots of hidden treasure, is a big part of the experience, dungeons are the real attraction here. Each has a series of real-time battles with underlings, several environmental puzzles to solve, an end boss, and an over-arching theme—Mystral Woods is a swampy, overgrown jungle with a fierce living tree guarding its exit, Sky Temple is a snowbound summit filled with frozen skeletons and totems spitting ice-cold air, etc. This works fine, in the Zelda tradition. A few of the bosses are challenging, some of the puzzles are clever, and a couple of the side quests are worth the effort. It's all very fine. In a world with so many inspired, ingenious action-adventure games, however, fine doesn't stand out. Mundane fetch quests, tired puzzle rooms, and samey skirmishes with goblins are not enough to elevate this title. In the end Mages of Mystralia embraces safe, reliable boilerplate game design. It's palatable, yes, but unspectacular. What is spectacular is its brave spellcrafting system, whereby players invent totally original spells by adding and subtracting behaviors, augments, and triggers. Zia owns four types of spells, from which she can form several variants. There's Immedi, a melee spell; Actus, a projectile spell; Creo, an area-of-effect spell; and Ego, a spell that modifies Zia herself in some way. Set Creo to "ice" and Zia will lay down a tile of frozen water. Add the behavior "move" and the tile will shoot forward, creating a frozen bridge. Set Ego to "ice," and summon an ice shield that can reflect light—essential in a late-game mine dungeon. Alternatively, set Ego to "earth" and "duplicate" and Zia can set down solid stone versions of herself, to weigh down pressure triggers. This spellcrafting framework is, far and away, the brightest part of the game. Graphically, Mages of Mystralia is rather feeble. Built in Unity, and featuring many flat, low-texture models and harsh lighting, it doesn't look great on Switch—whether on the portable screen or on a TV monitor. The storybook aesthetic helps cover up some of this, though. Music is a different story. Antoine Vachon does some remarkable and beautiful work here. "Mystral Woods," with its aggressive strings, and Water Quarry, with its lonely, icy piano notes, are two of the best tracks. There are moments in Mages of Mystralia where it feels like the game is ready for greatness. Its fantasy world is interesting, its music enchanting, and its spellcrafting system a revelation. Most of the time, unfortunately, it's satisfied with being safe, familiar, and unambitious. A sequel, building upon the game's promise—"become a spellmaster"—and boasting more lively puzzles, dungeons, and bosses, could be something special. This review is based on a digital copy of Mages of Mystralia for the NS, provided by the publisher.